Why is Relative the right choice, not Absolute, when saving CIE-Lab values? Why does rendering intent affect Lab values, which are device independent? Are there any other changes I should make to the following set of CMS preferences if I want to save correct Lab values? 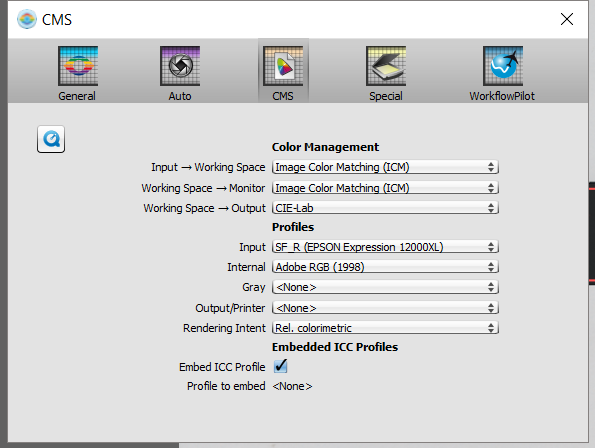 I don't think that it has anything to do with using the CIE-Lab colour space, and you should only use absolute colorimetric rendering intent if you are doing colour proofing. Relative (or perceptual) intent is nearly always a better choice, and I wonder why you want to use absolute colorimetric, or the CIE-Lab colour space, for that matter. Absolute colorimetric differs from relative colorimetric in that it doesn't map source white to destination white. Absolute colorimetric rendering from a source with a bluish white to a destination with yellowish-white paper puts cyan ink in the white areas to simulate the output of one printer (including its white point) on a second device. I don't know why you have experienced such a marked colour shift, but most white printer papers contain optical brighteners that can confuse colorimeters. White papers without optical brighteners will generally have a yellowish tint, and this will be picked up by a good colorimeter when using absolute colorimetric rendering intent. If you are scanning a fine-art book, the paper is likely not to contain optical brighteners. Note that the conversion algorithms between CIE-Lab and other colour spaces can introduce inaccuracies, especially if you are using 8-bit channels. Always use 16-bit channels with CIE-Lab. If you value the hair on your head, stick to relative or perceptual colorimetric rendering intent, and only use CIE-Lab if you have a real reason to. There's nothing wrong with Adobe RGB. If you are scanning for web content, keep it simple and use perceptual and Adobe RGB. Edit: Thinking back to my colour management days, I had horrendous colour shifts if I inadvertently triggered double conversion, either on input or output. However, I was using Photoshop CS2 with Windows 2000. Neither the application nor the operating system knew what the other was doing. Maybe things have improved since then. Not the answer you're looking for? Browse other questions tagged scanning lab-colorspace or ask your own question. How to use histogram adjustment when scanning?